Main : Christian Books : Books by Dr. George M. Stover Jr.
Dr. Stover offers a clear picture of what integrity means and how to get it back. Real integrity is lacking throughout the world. 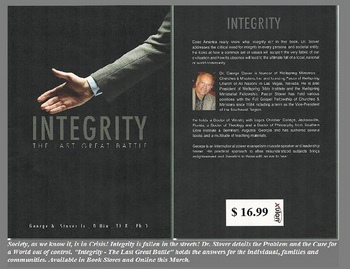 Dr. George M. Stover Jr.’s new book, Integrity—The Last Great Battle ($16.99, paperback), aims to restore personal and societal integrity, which will avoid the ultimate fall of local, national and world communities. Stover offers a clear picture of what integrity is and the role it plays in supporting a safe and secure societal structure. This book offers readers the knowledge needed to revitalize integrity on a personal level as well as community and international levels.